Cleanig of the Splashback panels is very easy. The best results can be reached by using a soft micro-fibre or chamois leather cloth and water and non-abrasive soap or common detergent. Even grease or oil can be easily removed by kerosene. Splashback is inactive and highly hygienic and does not support multiplying of bacteria or their transfer. 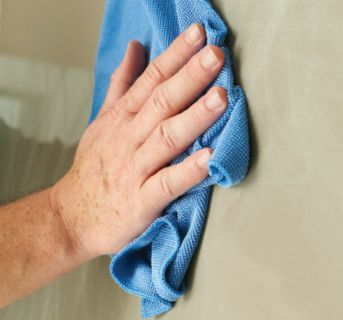 As well as all other decorative areas with high gloss do not dry wipe the surface. Avoid using paper towels. Brushes, scourers and scrapers should never be used. Whereas Splashback has been designed as serviceable (comfortable for a user) and ecologically friendly, we have created the surface which does not require strong chemicals and effort during cleaning. Smaller scratches and abrasions are easily removable by liquid polishes and soft polishing cloths. At an average damage surface can be completely regenerated by very soft wet or dry abrasive paper, manually or in a case of need mechanically. With a minimum effort Splashback will still keep its highly shiny surface.